The rate at which I buy palettes has definitely slowed down this year. I’ve come to that point where I realise that I really do have a lot of makeup and so for me to purchase an extra item that isn’t part of my staple collection, then I have to really like it. There have been quite a few palette releases since then, like the much loved Urban Decay Naked Heat palette which looks lovely, but I just have so many warm toned eyeshadows that virtually replicate that palette that I couldn’t justify it. The Morphe X Jaclyn Hill palette had those warm tones but with added cool tones and some brights which sold it for me. Plus you get a lot more shades. So here we are…. 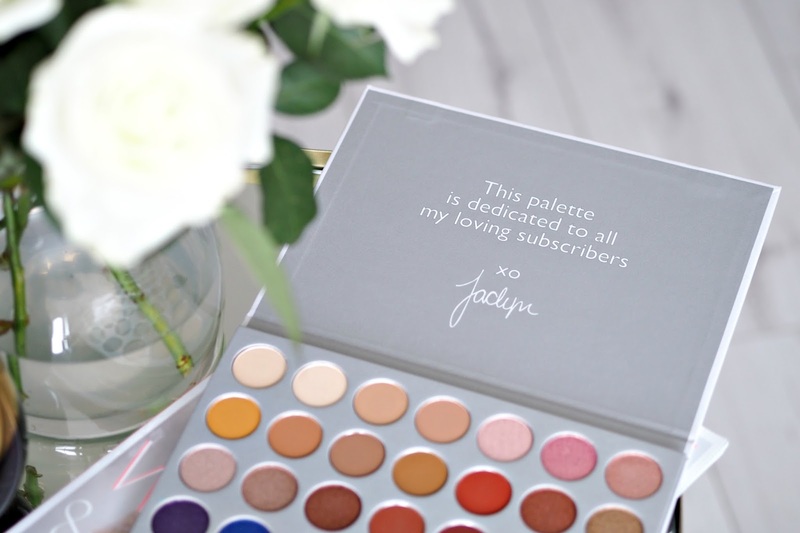 with the Morphe X Jaclyn Hill palette – my first palette purchase in 5 months! 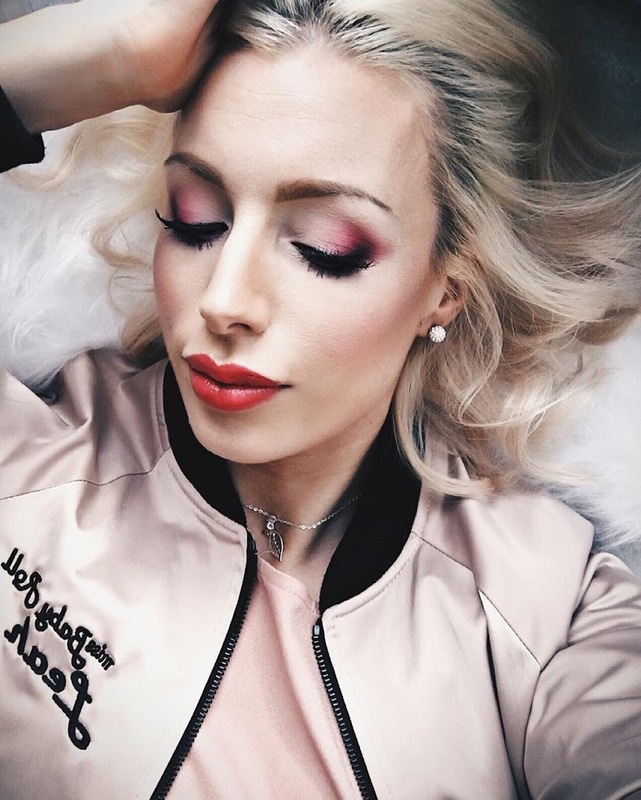 I’ve been wearing nothing but this palette for a good few weeks now so I wanted to give you my thoughts…. 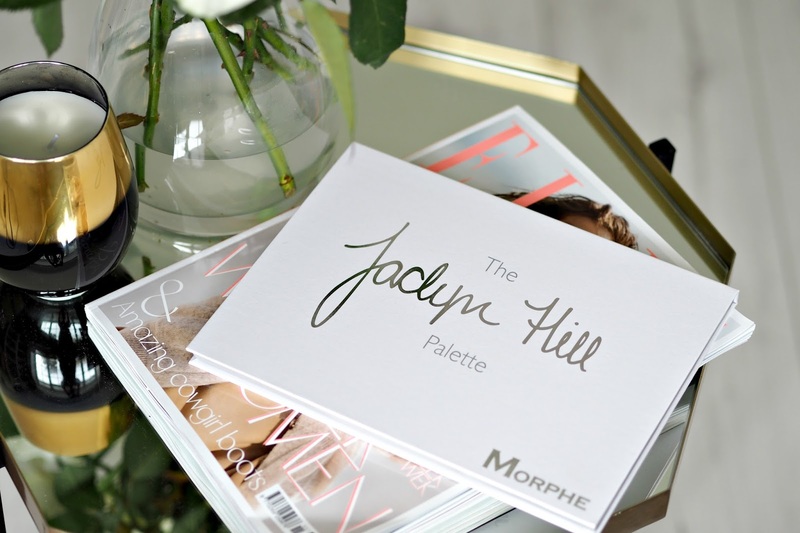 The Morphe X Jaclyn Hill palette comes in a sturdy white cardboard packaging which differs from their usual black plastic design of previous palettes. 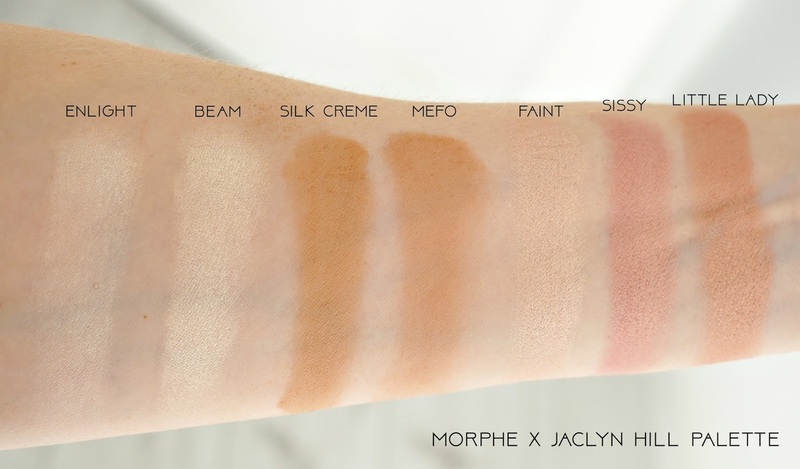 I like that it’s fairly light for a palette of its size but as you can imagine white isn’t the best colour when dealing with coloured eyeshadows. Mine already has coloured fingerprints and smudges all over it. Annoyingly the name of the colours are nowhere to be found on the packaging, so I’ve had to google what the names are of each shade to be able to put this post together. 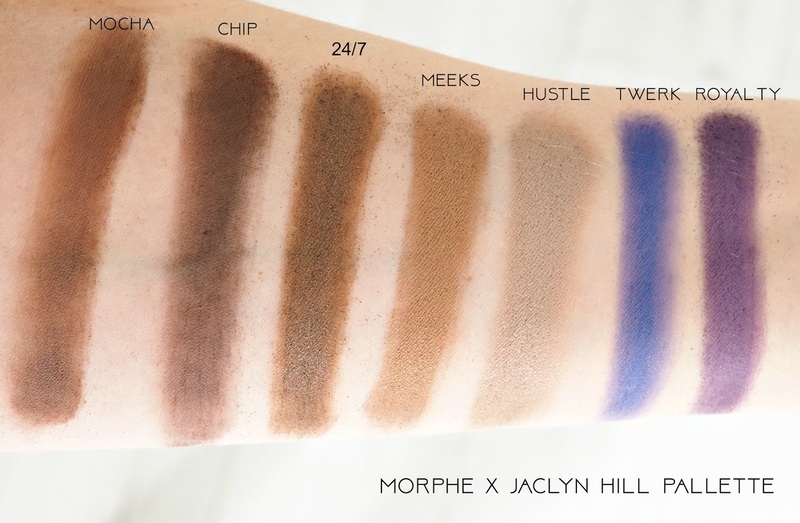 As the name suggests it’s been brought out in conjunction with beauty YouTuber Jaclyn Hill. With her name slapped on the palette and the supposed new machines being used to press the new shades, the price is a lot higher than any of the other Morphe palettes. Morphes standard 35 shadow palettes retail for about £23 in the UK, but the Morphe X Jaclyn Hill palette costs £37 – over 60% more!! With a price increase of that increment and all the hype around this palette I was expecting it to be incredible! So let’s get into my thoughts of the palette – the reason you’re here…. The palette contains 35 shades with a mixture of matte, shimmer, satin, foil and glitter shadows. 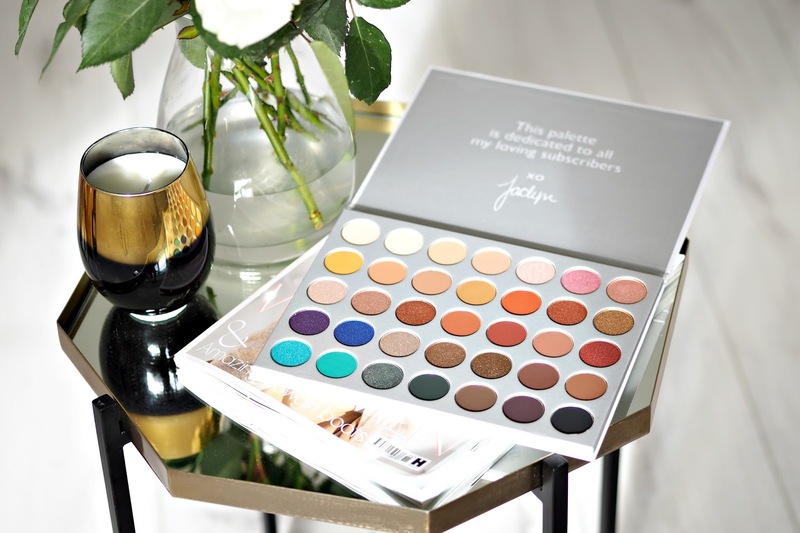 When I first opened the palette I was so excited – the majority of colours seemed to compliment each other and I could see how they would make some lovely looks when paired. However “Royalty” and “Twerk” seemed to be a bit lost as there were no other lighter matte purple or blues to pair them with, so I think I will have to use shades from another palette to use those two. This palette also massively lacks a matte white/ ivory shade. I say this everytime but it’s always the colour I hit pan on first, as I always use it for the top of my brow bone for every look I do. 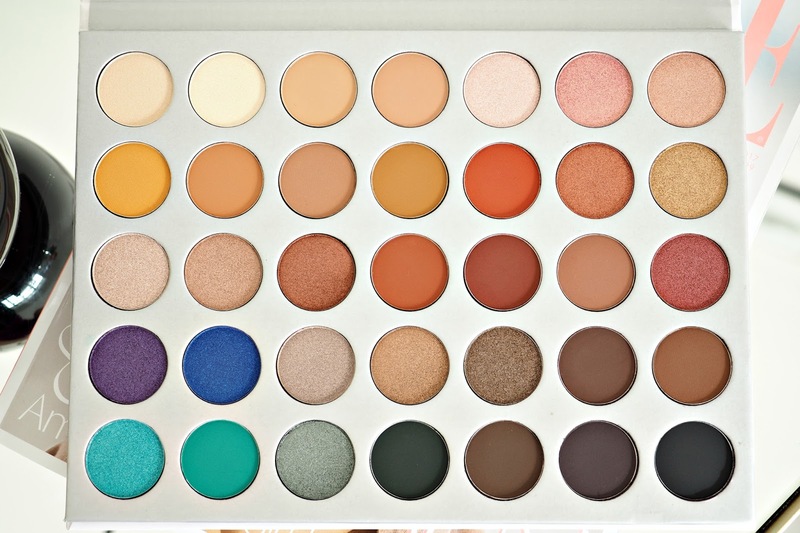 For me this means I would never be able to use just this palette and nothing else. I would also have to use a white from another palette or one of my singles. 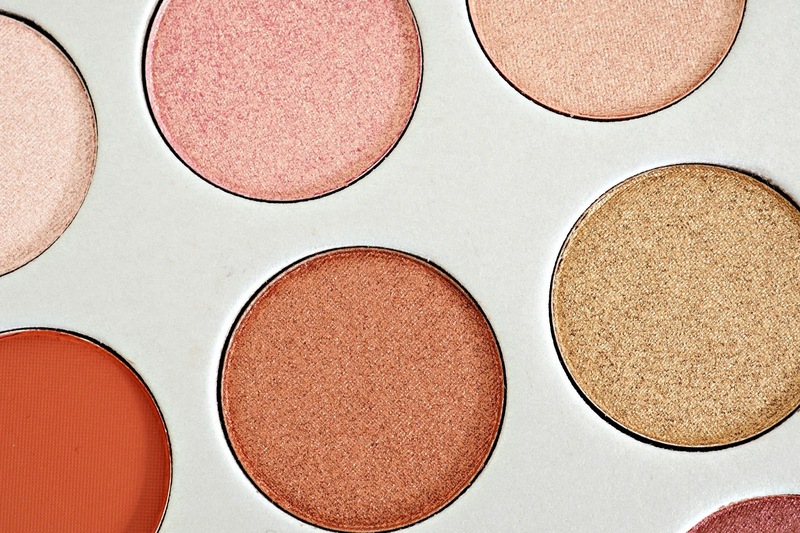 On to the formula…… The shimmer and foil colours are definitely the star of this palette. They are creamy, pigmented and blend well with little fall out. If shimmers are your thing you will love these. Shades “24/7” and “Royalty” are a real let down though as they are gritty, not as pigmented and do have more fallout than the others (see pics below). They are more glitter shades than shimmers though which is probably why. The mattes on the other hand have been a bit of a let down for me, which is a real shame as mattes are my favourite. Now don’t get me wrong they aren’t bad but I just expected more. They are incredibly pigmented but they feel quite dry and don’t blend anywhere near as well as my holy grail ABH shadows. I have to do a lot of blending to get these to look seamless and by the time I’ve done that, I’ve blended the majority of the pigment out. So I end up going over the shade again. I mean I know I like to blend, but a girl got places to be! As I say, it’s not that they are so bad I won’t use them, I’ve been using them for weeks, but I’ve just got better formula matte shadows in my collection than this palette. 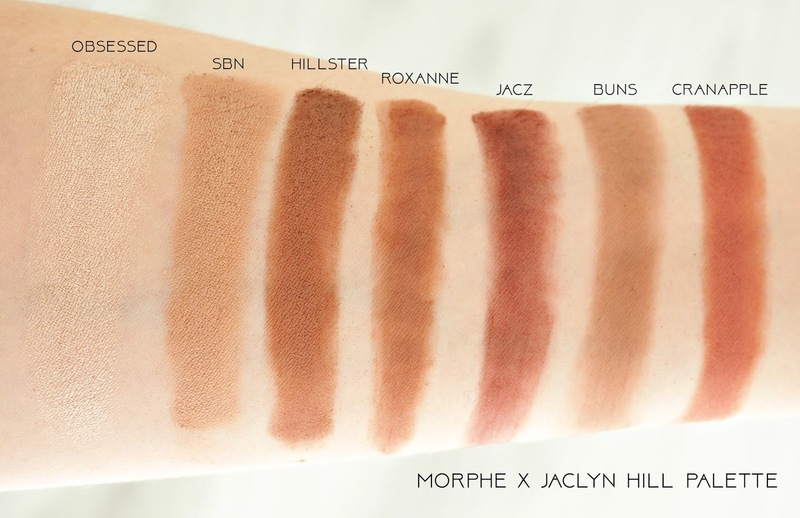 My biggest issue with the Morphe X Jaclyn Hill palette is the shade selection. Now, I of course saw photos of this palette before I purchased it but that only ever gives you an idea. A palette needs to be seen in person to really understand it. As you can see in these photos a lot of the colours look similar in the palette. When swatched you can see slight differences, a bit more gold or a shade darker for example. However once used on the lid they are virtually identical and you can’t tell them apart. By accident one day I used “Sissy” on one eye and “little lady” on the other and you couldn’t tell! That is the same for so many of these shades sadly. 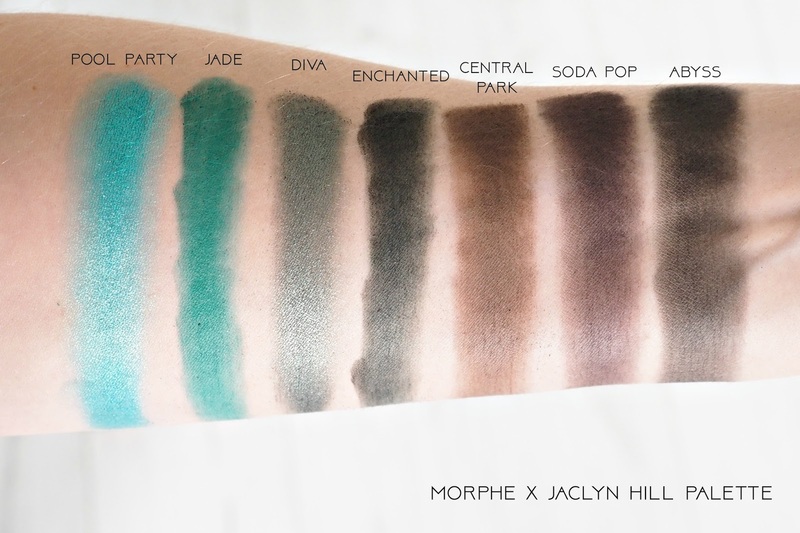 “Chip”, “Mocha”, “Soda Pop” and “Central Park” are all way to similar. The same goes for “Silk Creme”, “MFEO” and “Butter”. As well as “Enlight” and “Beam”. Swatching is one thing, using them is something else and you really need to use them before you can tell how different they actually look on, or in this case don’t look! In my opinion this palette could easily be half the size and you could still achieve the same looks. 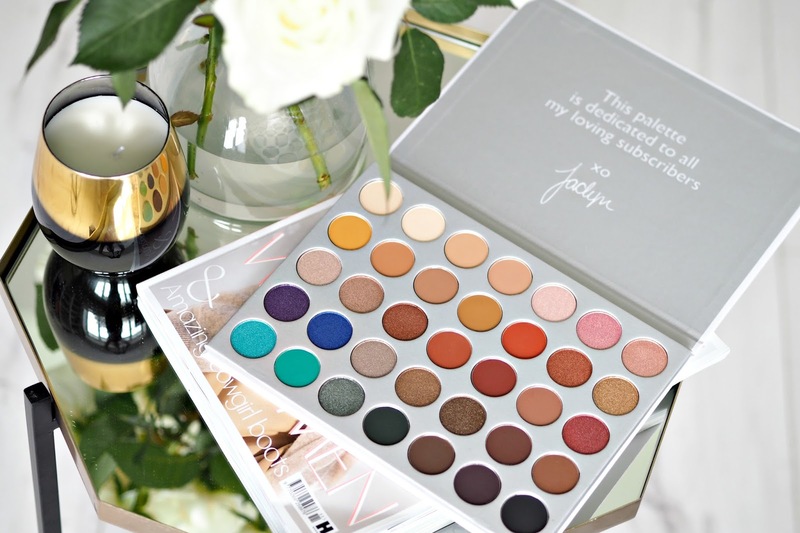 I could justify the price of this palette if it was outstanding, but for me it was no better than the Morphe 35K palette I own – in fact I think the matte shades in that palette blend much better and it’s only £23! For the price, the poor colour selection and the disappointing mattes this isn’t a palette I would be urging others to buy. If you are buying mainly for the shimmers and foils then I’m sure you’ll like it. I know so many who love this palette a lot so I’m probably the odd one out with these thoughts, but I gotta say it how I find it. 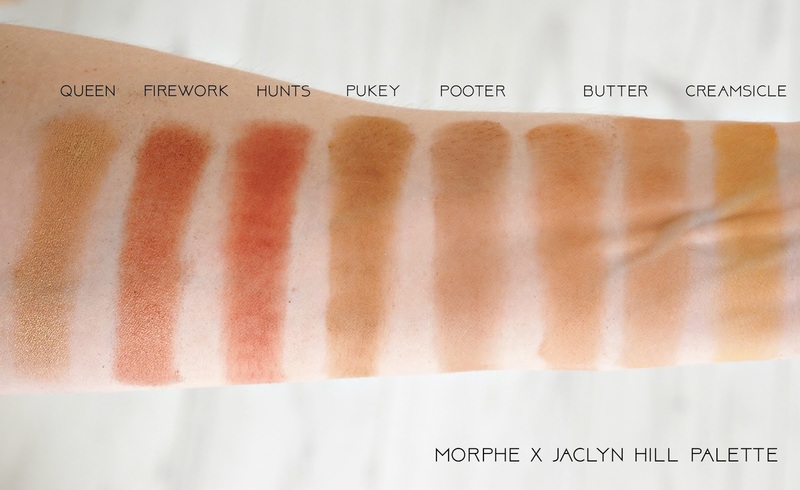 P.s Sorry, I swatched “Butter” twice in the above photo and I only realised once I was writing this post (just in case you wondered…)!